Ever wonder just what it takes to get started in home recording—what gear you need and why, and how to hook it all up? In this interview, Shachar Gilad of Waves explains everything you need to know about setting up your personal production studio and recording your first session. It's easier than you think! What's the minimum setup needed to record at home? Typically, you can get away with a microphone, a decent audio interface (aka I/O), a reasonably fast computer, audio software for recording and mixing, and powered studio monitors (speakers)to hear what you're doing. With a decent large diaphragm condenser, you'll be able to record vocals, acoustic guitars and other acoustic instruments. In terms of audio software, you'll need a host (aka DAW, digital audio workstation) such as Pro Tools, Logic, Cubase, etc to record and mix in, and plugins for mixing down the recorded tracks. Plugins are the effects and processors that make the recorded tracks sound better and more interesting, but we'll get to that in a bit. If you play keyboards, you'll want a hardware or software synth. Either way, you will need a keyboard, aka a MIDI controller. Some have built-in sounds, and many these days do not; they simply control software synths. If you play electric guitar, having an amp or amp simulator is essential. If recording acoustic instruments is not the focus, instead of a large diaphragm condenser, you can use an inexpensive dynamic microphone such as a Shure SM57, which you would place in front of your amp. There are great guitar amp software simulators that let you plug a guitar directly into your computer through the I/O, and have it sound like you placed a microphone in front of an amp. Electric bass can be easily recorded DI (direct) through the I/O and then "re-amped" with guitar software such as GTR. If you are doing hip hop, you may choose to work with a hardware sampler such as an MPC or a software sampler. So basically, the minimum you'd really need is recording and mixing software, an I/O, and monitors. Microphones, instruments, a keyboard controller, a better microphone preamp, a hardware compressor, and other equipment is optional depending on your needs and budget. For example, if you will not be recording acoustic instruments, but just making beats, you will not need a microphone. If you are recording just guitars and voice, you will not need a keyboard controller. If you want very high quality voice recording, you may want to invest in a hardware compressor for your recording chain and an external mic preamp that is better than the one built in to the I/O. Depending on your budget, the built in mic preamp in your I/O may suffice. Why do I need an I/O? An I/O is really just a fancy soundcard, but the soundcard built into your computer is probably not good enough for any serious audio work. For example, it will typically have inputs that are designed for line levels (not microphone levels), it will have latency (latency is a slight delay, and when it exists, you can't listen to what you record in real time), and its converters are most likely less-than-ideal, which translates into poor sound. Audio interfaces designed especially for audio work don't have these issues, and many of them are affordable. Analog-to-digital converters take an analog signal and convert it to a digital signal, which is what your computer understands. This is an important step in getting sound into and out of your computer. What's a microphone preamp? Do I need one? 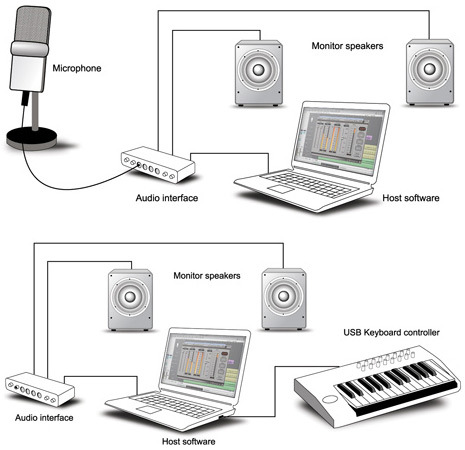 Microphone preamps get sound from your microphone to a level that audio devices can handle. Most affordable audio interfaces have a couple of built-in mic preamps. Some people prefer to get external microphone preamps of better quality than those built into the audio interface. Do I need a MIDI interface? That depends on the kind of MIDI controller you have. Many keyboards controllers these days connect to the computer directly via a USB cable instead of through a dedicated MIDI interface. The "language" that it uses for sending data to the synths is still MIDI, but the connection is USB, and saves you having to buy a separate MIDI interface. Do I need an amplifier for my speakers? Not necessarily. Many monitors these days are powered, which means they have a built-in amplifier and don't require an external one. Makes things easy. If you are using non-powered speakers, you will need a power amplifier. So how do I start recording? I like to start with a rhythmic element such as a loop or drums. This helps me keep time and gives me structure and beat. 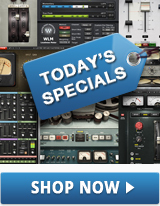 You can use software drum modules, drum machines, or loop libraries to get you going. Of course, you'll need to find the right tempo for the song. Once you have a basic beat, you can start recording other elements. Let's record an electric guitar, acoustic, bass, some keyboard pads and voice. Using a regular guitar cable, plug your electric guitar into the D/I or instrument input on your I/O. Find the right input level by playing as loud as you'll possibly play, and making sure the LED indicator light on your I/O (if there is one), doesn't hit the red. Create a mono audio track in your DAW (host software), record-enable it, set the input to receive your guitar, and again, make sure you're not hitting the red in the meter on the track within the host. On your track's "plugins" or "inserts," bring up a software guitar amp such as GTR, and find the sound you like. If you are hearing a short unwanted delay , try to lower the buffer in your host software's audio preferences. Lower buffer means less latency (delay), but is more taxing on your computer, so it may lead to error messages or crackles. Find the sweet spot. Hit record and have fun. Do the same thing with your bass. Make sure to adjust levels (don't hit the red! ), then find and insert a good bass amp setting on your guitar software plugin. GTR has Bass amp settings. Now let's record keyboard parts with a software synth. Connect the controller to your computer, and open an instrument track in your host. Make sure you are receiving MIDI signal from your controller. You'll know if there's activity on the track's meter when you play on the keyboard. Bring up a software synth plugin on this instrument track, find the sound you like, hit record, and away you go. When you are satisfied, you can quantize the MIDI track using the MIDI options in the host software. Quantizing places the MIDI notes you recorded "in time," assuming your session was based around a tempo map or grid in the host software. If you have a hardware synth, then you simply connect its outputs to the line-in on the I/O. If the synth has a stereo output, open a stereo audio track in your host, record-engage it, make sure the level is good in the meter, and record. You can also connect the MIDI outs of the synth to the host as well, and record the MIDI information, for later editing or playback using other synths. On to vocals: Connect your microphone to the mic preamp on your I/O, place a pop-filter a couple of inches away from it to avoid air filled poofs (these are very inexpensive). Set the level the same way as before after creating and record-enabling a mono audio track and go. Don't forget to turn down your monitor level and use headphones; otherwise, you'll get bleed (sound from the speakers into your microphone) and possibly feedback – no a good thing. Once you finish recording, it's time to mix. Mixing is an important part of the recording process, and all the music you hear on the radio, CDs, TV, movies, and video games gets mixed. Mixing is the process of taking several recorded tracks and combining them down to two tracks – left and right, aka stereo – which is the final output. During this process two important things happen: First, the different recorded elements are leveled, based on what gets focus in which part of the song and sounds right, and second, each element is treated to make it sound better, more interesting, and give it its own unique sonic character and space. This important mixing stage is where plugins come in. Compressors are used to level the volume of elements, as well as to manipulate their sound. Using a compressor on a snare can totally change the way it sounds, for example, giving it punch and snap. Using compression on vocals can make it sound fuller, bring it closer, and make it sound more intimate or urgent. Equalizers can make sounds brighter or warmer. Reverb and Delay give instruments a sense of space and lushness, and limiters can be used to make the whole song sound louder. There are many tutorials online (such as this) and on YouTube that show how to approach mixing, how to mix vocals, drums, and other elements. Mastering is the finishing touch, which is done to songs that are already mixed down to a stereo file. Mastering is a subtle but important step which has two primary purposes: To make different songs sound consistent, like they sonically belong on the same record, and to make them competitively loud, so they don't sound weak when played together with other professionally mastered songs in sequence on the radio, in iTunes, on an mp3 player, YouTube, MySpace, etc. Usually, a collection of mixed songs are mastered together, but when home producing, people sometimes master a single song as they are mixing it, using plugins on the 'master bus' in the DAW, to give the song a full, clear, loud sound. There are many tutorials on mastering, but delicate use of a good compressor, EQ and Limiter, and good monitor speakers are the most important elements. For additional mixing tips, check out Waves tutorials.